In mammals, transcription in the zygote begins after fertilization. This transcriptional wave is called zygotic gene activation (ZGA). During ZGA, epigenetic modifications, such as DNA methylation and histone modifications, are dynamically and drastically reconstructed in a sequence-specific manner. However, how such orchestrated gene upregulation is regulated remains unknown. 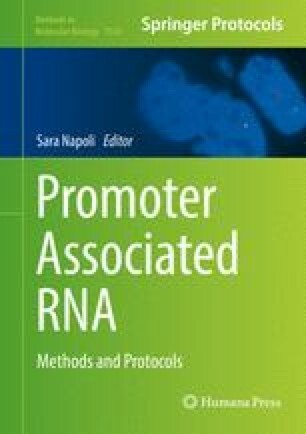 Recently, using microinjection techniques, we have revealed that a class of long noncoding RNAs, named promoter-associated noncoding RNAs (pancRNAs), mediates specific gene upregulation through promoter DNA demethylation during ZGA. Here, we describe the experimental methods available to control the expression levels of pancRNAs and to evaluate epigenetic status after pancRNA manipulation. We thank Dr. Elizabeth Nakajima for proofreading the manuscript. We thank Katsuhiko Hayashi for discussion. This work was supported by Grants-in-Aid [No. 15H04603] to T.I. from Japan Society for the Promotion of Science (JSPS). N.H. is supported by a JSPS Research Fellowship.